WASHINGTON -- Social Security, Medicare and Medicaid need significant changes to be preserved for future generations, President Donald Trump’s pick to head the White House budget office told Congress on Tuesday, putting him at odds with the new chief executive. South Carolina Rep. Mick Mulvaney also said tax increases would be on the table to help shore up the federal government’s largest benefit programs. Mulvaney’s comments at his Senate confirmation hearing stand in sharp contrast to Trump’s campaign pledges not to cut the programs. Trump has also pledged to cut taxes, not raise them. The comments came on the same day that congressional analysts said Trump has inherited a stable economy but a government that faces a worsening debt and deficit outlook. All told, Trump is staring at deficits that would add more than $9 trillion over the coming decade, rising to $30 trillion by 2027. Such deficits are sure to crimp Trump’s promise to cut taxes, and more conservative Republicans may chaff at them and press for spending cuts that the new president doesn’t like. The estimates from the nonpartisan Congressional Budget Office say the economy will hold relatively steady, with economic growth rising slightly to 2.3 percent this year and unemployment averaging less than 5 percent for the duration of Trump’s term. The agency expects a budget deficit for the current year of $559 billion, roughly the same as last year’s, the final year of Barack Obama’s term. Mulvaney said he would not propose cutting Social Security or Medicare benefits for people already receiving them. But, he added, younger workers should expect to work longer than their parents. He also said Medicare should be means-tested, which means benefits would be limited for wealthy retirees. They already pay higher premiums. Sen. Bernie Sanders, an independent from Vermont, read quotes from Trump during the campaign saying he would not cut the benefit programs. 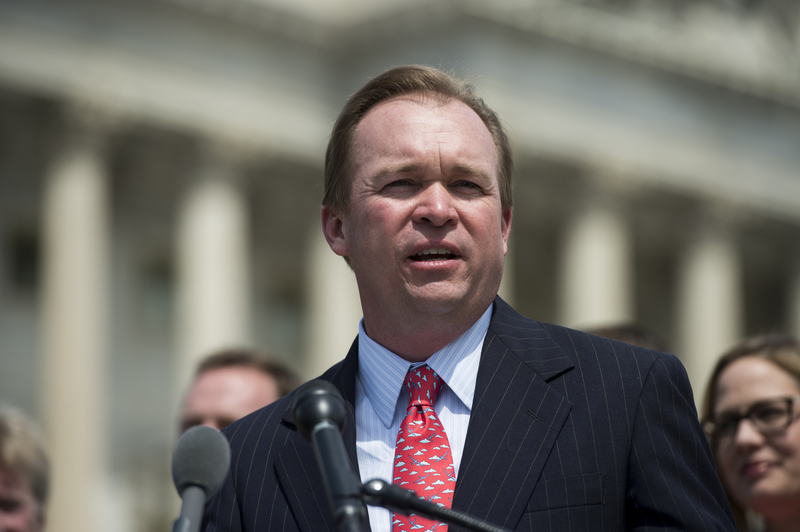 Yet, as a member of Congress, Mulvaney has been outspoken on changing the programs. “I have to imagine that the president knew who he was getting,” Mulvaney said. Trump’s staunchly conservative choice to lead the White House budget office was elected in the 2010 tea party wave. He’s been a supporter of the House GOP’s plan to cut back Medicare by turning it into a voucher-like program for future retirees. Trump has said he opposes the idea. As a member of Congress, Mulvaney signed a pledge not to raise taxes. But on Tuesday, Mulvaney said he would be open to increasing the amount of wages subject to the Social Security payroll tax, in addition to gradually raising the retirement age and other benefit cuts. “I will not be bound by that” pledge, Mulvaney said. Social Security is financed by a 12.4 percent tax on the first $127,200 of a worker’s wages - an amount that increases most years with inflation. Workers pay half and employers pay half. Congressional Democrats have called for raising the payroll tax cap or eliminating it altogether. Washington’s red ink continues to be an intractable problem that would steadily worsen over time, CBO estimates. The agency warned that such rising deficits and debt “would have significant consequences” and act as a drag on the economy if left unchecked. Unless Congress acts, Social Security’s trust funds will be depleted in 2034 and Medicare’s trust fund for inpatient care will be exhausted in 2028, according to the trustees who oversee the programs. If Congress allows either fund to run dry, millions of Americans living on fixed incomes would face steep cuts in benefits. Mulvaney also faced questions on his failure to pay more than $15,000 in payroll taxes for a household worker more than a decade ago. Sanders said the lapse should disqualify Mulvaney from being confirmed, though most Democrats didn’t raise the issue. Mulvaney said he failed to pay the taxes for a babysitter because he did not consider her a household employee. “We made a mistake,” Mulvaney said.